Giftly, a San Francisco-based startup that lets you send any kind of gift to a friend or family member, has just come out with a native mobile app that makes it easier to send presents on the go. It’s the company’s first native mobile app after having a mobile web-based presence for awhile. What’s unique about Giftly is that you can send any kind of gift without having to go through a merchant. There aren’t limitations on what kinds of presents you can send, unlike competitors like Karma (which was recently acquired by Facebook and has a limited catalogue of items to choose from). You enter the app and can pick from a suggested selection of items from beer to a meal to a day in Paris. Or you can invent your own gifts. Then you can select a couple of places like restaurants, bars or stores to redeem the gift at and then the monetary value of the gift. Then you send it to a friend. 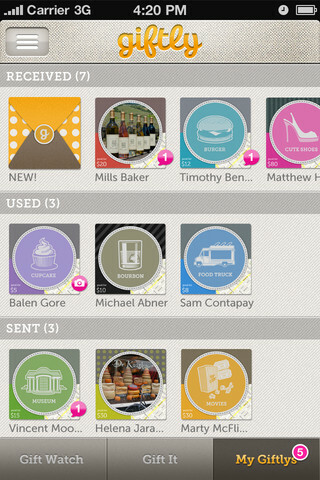 The trick underlying the app is that Giftly has a web of relationships with banks and credit card processors. When the recipient goes to redeem their gift, they pay themselves, but Giftly will reimburse them that amount through their credit card. In a sense, the more gifts you receive and send to friends, the more Giftly can serve as a mobile wallet or a record of what you’ve consumed or where you’ve gone. The company’s new app lets you send gifts directly through your phone. Before, you could only do it through the website. That makes it easier to — for example — give a friend a beer when you see them check into a bar. There’s also a bigger emphasis on items, since users tend to give smaller gifts. “When people are giving gifts, they’re not necessarily thinking about a place, they’re thinking about an item that they want to give a person — whether that’s dinner or coffee via a Starbucks gift card,” said Giftly’s CEO Timothy Bentley, who was the first employee at social question-and-answer company Aardvark. Another addition to the app is a news feed that shows birthdays and other notable events, which will help remind users when to give gifts. There’s also more ability for follow-through after the recipient gets their gift. Giftly now has messaging, where there was only the ability to send a “Thank You” note before. The 10-person company has raised $2.8 million so far from investors including Baseline Ventures, SoftTech VC, Floodgate, Thrive Capital, and Techstars’ David Tisch. Giftly earns a small cut of each transaction, which ranges depending on the value of the gift.